Do you trust me yet? I mean really trust me? Surely by now you know that I would never suggest anyone make anything that I don't think is absolutely delicious. I am not in the business of eating or promoting bad food, so if I don't like something I tried I will definitely keep it to myself. Are you still with me? Good. We are going to talk about tofu. Yesterday, I would not have talked about tofu. Today, I really want to talk about it. Why? Well, because it was the star of the show in one of the most delicious meals I've made in recent months. Absolutely fantastic. I'm flabbergasted. It's not that I have a true dislike for tofu, it's just that it's always something extra and sort of unremarkable anytime I happen to eat it (most often in Miso soup at a Japanese restaurant). When we set out on this vegetarian-ish year, I did not intend to make tofu. So why did I? Well, because my husband asked me to. He really likes it, and I suppose I didn't know this because I made an assumption--why would my meat-loving husband want me to try and "replace" his beloved meat with a mushy soybean creation? It just sounds wrong, doesn't it? (Yes, yes it does). I've been ignoring his suggestions that we eat some tofu for about three months now, but when my new cookbook arrived last week (Meatless, from Martha Stewart), it contained several beautiful-looking tofu dishes. The time was right to give tofu an honest try. This meal was outstanding, and the tofu was awesome. It was truly meaty in texture, flavorful, and a nice complement to the crunchy vegetables. If you absolutely cannot bear to use it, you could certainly marinate chicken, shrimp or beef (about a pound) as described below and then proceed as directed. But I'm telling you, the tofu is good. Really good. Even my 4 year old liked it (gasp!). Welcome to my kitchen, tofu, you are here to stay (when you are first pressed and then marinated, of course). extra veggies if you want (I had a lovely bunch of young tender asparagus, so I snapped the ends and then cut into thirds. Broccolini, green beans, and snap peas would all be great). You have to first press your tofu. This decreases the moisture content, and makes it firm and dense. It actually helps it to brown more in the pan, thus making it more meat-like in texture and flavor. I pressed mine by first cutting the block in half lengthwise. I set the halves on a few layers of paper towels, added a few more layers on top, and topped it all with a cookie sheet. I then weighted the pan with several cans, went downstairs and hit the treadmill for 30 minutes, and came back upstairs to pressed tofu. You can certainly omit that treadmill step, but I love being able to do two things at once. Makes me feel productive to say that I pressed tofu AND worked out in the same half-hour. I'm ridiculous. You can actually press your tofu up to two days ahead of time and just store it in the fridge until you're ready to go. Nice, huh? 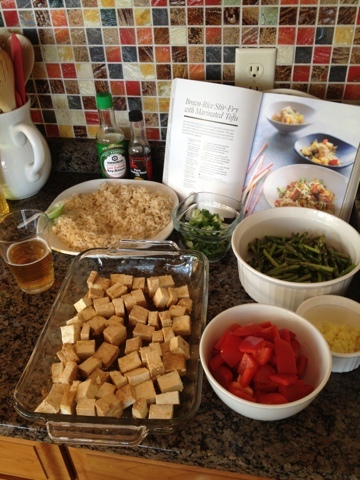 When you are ready to actually make dinner, dice your tofu into 1" chunks (I threw mine back in the marinade for extra luck) and get your 'mise en place'. This is French for 'get your act together'. No, seriously, it just means to get all of your ingredients prepped so that when you are cooking something that comes together quickly (like a stir-fry), you can avoid that frazzled feeling that comes when you are chopping as you go and potentially miss something or burn it up. It is a lovely feeling to have your mise en place ("everything in place"). Feel free to do this all ahead of time and stick it in the fridge. You will be so happy and stress-free as you are making this wonderful-smelling, beautiful meal. Now you are ready to roll, and your dinner will come together in a flash. Heat a small amount of canola or vegetable oil in your skillet or wok (do not use olive oil, it will burn). Saute your tofu, stirring occasionally, or until golden brown. This will just take a few minutes. I did this in two batches so as not to crowd the pan. Crowding the pan=steam. Not good for this. Transfer the tofu to a bowl. Add a bit more oil to the pan and saute garlic and ginger until fragrant (30 sec), then add bell peppers and asparagus (or whatever you are using) and saute for 3 min or until crisp-tender. Stir in rice, remaining 3 T. soy sauce, and 1 T. sesame oil and heat through until rice is hot. Add scallions and fold in tofu. Toss everything together gently and then season with more soy sauce (or salt/pepper) if you need to. Step back and admire your work.